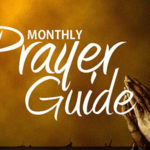 To read or download our February 2018 prayer guide for your daily use, click here. Please see our Prayer Ministry page for other ways you can get involved in the prayer life of the church. To read or download our January 2018 prayer guide for your daily use, click here. Please see our Prayer Ministry page for other ways you can get involved in the prayer life of the church. To read or download our November 2017 prayer guide for your daily use, click here. Please see our Prayer Ministry page for other ways you can get involved in the prayer life of the church. To read or download our December 2017 prayer guide for your daily use, click here. Please see our Prayer Ministry page for other ways you can get involved in the prayer life of the church.